WARNING: This is the OLD IUF website. strict warning: Non-static method view::load() should not be called statically in /homepages/36/d105421224/htdocs/cms/modules/views/views.module on line 1113.
strict warning: Declaration of views_handler_field::query() should be compatible with views_handler::query($group_by = false) in /homepages/36/d105421224/htdocs/cms/modules/views/handlers/views_handler_field.inc on line 1147.
strict warning: Declaration of views_plugin_localization_i18nstrings::translate_string() should be compatible with views_plugin_localization::translate_string($string, $keys = Array, $format = '') in /homepages/36/d105421224/htdocs/cms/modules/i18n/i18nviews/includes/views_plugin_localization_i18nstrings.inc on line 59.
strict warning: Declaration of views_handler_sort::options_validate() should be compatible with views_handler::options_validate($form, &$form_state) in /homepages/36/d105421224/htdocs/cms/modules/views/handlers/views_handler_sort.inc on line 165.
strict warning: Declaration of views_handler_sort::options_submit() should be compatible with views_handler::options_submit($form, &$form_state) in /homepages/36/d105421224/htdocs/cms/modules/views/handlers/views_handler_sort.inc on line 165.
strict warning: Declaration of views_handler_sort::query() should be compatible with views_handler::query($group_by = false) in /homepages/36/d105421224/htdocs/cms/modules/views/handlers/views_handler_sort.inc on line 165.
strict warning: Declaration of views_handler_filter::options_validate() should be compatible with views_handler::options_validate($form, &$form_state) in /homepages/36/d105421224/htdocs/cms/modules/views/handlers/views_handler_filter.inc on line 587.
strict warning: Declaration of views_handler_filter::query() should be compatible with views_handler::query($group_by = false) in /homepages/36/d105421224/htdocs/cms/modules/views/handlers/views_handler_filter.inc on line 587.
strict warning: Declaration of views_plugin_query::options_submit() should be compatible with views_plugin::options_submit($form, &$form_state) in /homepages/36/d105421224/htdocs/cms/modules/views/plugins/views_plugin_query.inc on line 169. Management of Nestlé Waters Russia has declined to appeal the court-ordered reinstatement of Sergei Strykov, Vice-Chair of the union formed last year who was fired on January 27. Strykov has also been compensated for wages lost from January through May, while the union was fighting his illegal dismissal. The latest video interview with Nestlé Chair Peter Brabeck takes place on the balcony at company headquarters in Vevey Switzerland, with Lake Geneva and the snow-capped Alps shining in the background. Brabeck relates his rise from ice cream salesman to head of the world's largest food company, with the reporter smiling approvingly: "You've come a long way." You cannot escape promotion, explains Brabeck, if you're just a bit better (expressed with mathematical precision as 5% better). At the June 1 meeting of the Nestlé European Works Council in Geneva, Switzerland, representatives of twenty Nestlé unions from across Europe collectively called on the company to immediately halt all attempts to weaken the IUF's affiliate at the Nescafé factory in Panjang, Indonesia. The unions insisted that Nestlé enter into the wage bargaining talks the union has been demanding for 3 years. We never bought it, so we can't change the recommendation to sell - but we have taken a closer look at the rating put on Nestlé's Creating Shared Value Report 2009 in order to investigate the reporting criteria - and whether they've been met. Unions around the world will be mobilizing again on April 28, each in its way highlighting the 360,000 annual workplace fatalities and 2 million deaths from occupational diseases. On April 28, as on every other day, some 960,000 workers will be injured in an accident at work, and some 5,300 workers will die of work-related diseases. 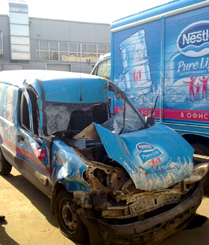 Workloads aren't all that has increased at Nestlé Waters Direct in Domodedovo, Russia. The local union sees a direct connection between the brutal increase in working hours and the 6 road accidents that have occurred in as many months - 3 of them in one recent week alone. 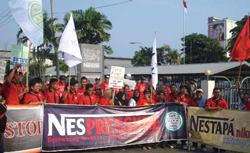 The Union of Nestlé Indonesia Workers in the Nescafé factory in Panjang, SBNIP, has been the recognised representative of workers in the Panjang factory and Nestlé's negotiating counterpart since 2000. In late 2007, the union put forward proposals for the 2008-2009 CBA, including negotiated wages (instead of the paternalistically imposed annual wage increases), which were clearly not to the liking of management. Nestlé, the world's largest food corporation, is rolling in money. The 2009 results recently announced show sales topping USD 102 billion (94.6 billion in the core food and beverages division), operating profits of 14.85 billion (up on the previous year), margins (much beloved of financial analysts) hitting an enviable 14.6%, and a breathtaking 67% increase in cash flow, up from USD 6.81 billion in 2008 to 16.93 billion in 2009. 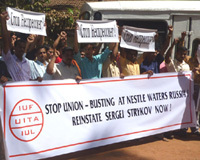 On February 25 the Nestle Ponda and Nestle Bicholim unions in Goa, India, held protest actions against trade union rights violations at Nestle Waters in Russia. The unions, members of the IUF-affiliated Federation of All India Nestle Employees, condemned union-busting at Nestle Domodedovo and demanded the reinstatement of the union vice-chair Sergei Strykov. Nestlé's Corporate Business Principles state that their business practices are "designed" to "establish a constructive dialogue with unions. In fact they have little choice - if they want to respect international Conventions and treaties which anchor this obligation in international human rights law. Check out the latest IUF videos on YouTube. The International Union of Food, Agricultural, Hotel, Restaurant, Catering, Tobacco and Allied Workers' Associations (IUF) is an international federation of trade unions representing workers employed in agriculture and plantations; the preparation and manufacture of food and beverages; hotels, restaurants and catering services; all stages of tobacco processing. The IUF is composed of 394 affiliated organizations in 126 countries representing a combined membership of around 2,6 million.